Why few people in the universe could relate to Tiger Woods' winning the Masters on Sunday quite like David Wright. Rookie slugger Pete Alonso hit his first major league homer, a three-run shot to cap a four-run ninth inning, and the New York Mets overcame 16 strikeouts by their hitters to rally past the Miami Marlins 7-3 Monday night. Mets utility player Jeff McNeil after going 4 for 5 with a triple and two RBI in a 11-8 win over the Nationals on Saturday, March 30 in Washington. Mets first baseman Pete Alonso after going 3 for 4 with two doubles and two RBI in a 11-8 win over the Nationals on Saturday, March 30 in Washington. 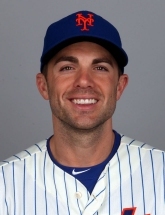 David Wright is adjusting quite well to his new, non-playing role with the Mets, apparently. He may not have been at the podium on Thursday, but Mets special advisor David Wright got a pretty noteworthy shoutout from COO Jeff Wilpon when asked what role he played in the Jacob deGrom extension negotiations. Jacob deGrom's $137.5 million wasn't the biggest one the Mets ever gave out (David Wright got $138 million), and it doesn't stand alone as the biggest the Mets ever gave to a pitcher.